Liverpool captain Steven Gerrard will have a scan on Thursday after limping off with a hamstring injury in the 3-2 win over Tottenham. The midfielder is a major doubt for Saturday's FA Cup fifth-round tie at Crystal Palace (17:30 GMT). It is another midfield setback for manager Brendan Rodgers after losing Lucas Leiva to a groin injury in the 0-0 draw with Everton. 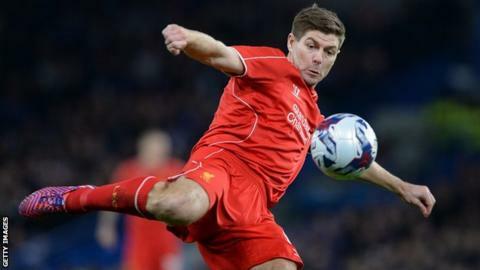 Gerrard, 34, will leave Liverpool to join Los Angeles Galaxy in the summer. The problem could not have come at a worse time for the Reds with six games in 19 days, including both legs of their Europa League round-of-32 tie with Turkish side Besiktas and Premier League matches against top-four sides Southampton and Manchester City. "Unfortunately, he felt his hamstring towards the end of the game and he is having a scan this morning and we are just waiting for results to come back," Liverpool assistant manager Colin Pascoe said. "Hopefully the scans won't show too much but as we've not got the results I can't say too much." Forward Raheem Sterling is another injury worry after missing the midweek game with a foot injury but Pascoe hopes he will be fit for the weekend. "We are monitoring Raheem," he said. "He missed a game the other night but we will see how he is."